The cheese-soaked Bollywood action blockbuster "Tiger Zinda Hai," a big splashy movie where Indian and Pakistani special agents team up to defeat Syrian terrorists holed up in Iraq, is retrograde, bloated, and formulaic. It's also consistently sincere, energizing, and charming. So it's not surprising that "Tiger Zinda Hai" is the second highest grossing Indian film of the year (after "Baahubali 2: The Conclusion"). This is, after all, the kind of chest-thumping, nationalistic spectacle that Peter Berg has, at his best, successfully translated into big box office bank here in America. 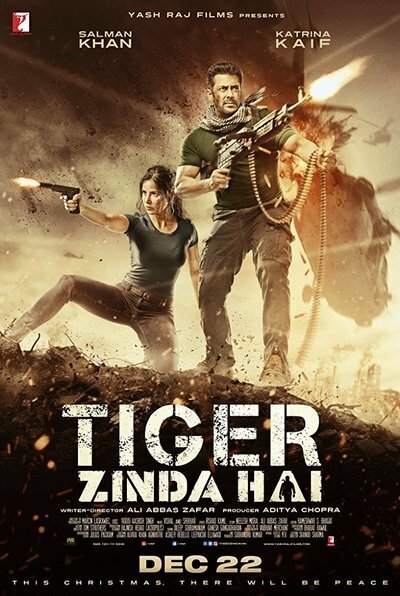 "Tiger Zinda Hai"—translated from Hindi as "Tiger is Alive"—is also the sequel to "Ek Tha Tiger," the #1 2012 movie at the Indian box office. Why wouldn't it make a mint? Arguably, what's most refreshing about "Tiger Zinda Hai" is that its creators don't just pay lip service to their characters' humanitarian values, and ideas like the makers of "Ek Tha Tiger" did. For starters, "Tiger Zinda Hai" is essentially an ensemble film headlined by co-stars Salman Khan and Katrina Kaif. This is no small feat since "Ek Tha Tiger" feels like a Salman Khan vehicle that also features Kaif. Think of the way that the recent "Ocean's Eleven" films are pretty much "putting on a show"-style musicals with more casino heists, and less dancing. In those films, George Clooney, Brad Pitt, and Matt Damon put their guys in place, and then let them do their respective things. That's what "Tiger Zinda Hai" is like, only instead of robbing Al Pacino and Andy García, these guys try to free a group of 25 Indian and 15 Pakistani nurses from a group of Syrian/Iraqi fundamentalist kidnappers/terrorists. Indian bureaucrat Shenoy (Girish Karnada) knows that only one man can stop the terrorists, and their cartoonishly vindictive leader Abu Usman (Sajjad Delafrooz). And that man is Tiger (Khan), a retired Indian super-spy who at the end of "Ek Tha Tiger" eloped with, rather than neutralized, his Pakistani super-spy wife Zoya (Kaif). True to cornball formula, Tiger returns from retirement—"somewhere in the Alps"—after briefly considering the consequences of returning to a violent but efficient life of shooting, stabbing, and exploding enemy combatants. Still, Zoya and their young son Junior (Sartaaj Kakkar) give Tiger the green light, so he goes ahead, and assembles a crack team comprised exclusively of war movie cliches (The dynamite expert! The sniper! The hacker!). Thankfully, Zoya and her own team of Pakistani spies join Tiger mid-way through the film's hefty 165-minute proceedings. At this point, the group's members put their political differences aside, and vow to work together for the sake of, uh, all "humanity." At this point, "Tiger Zinda Hai" has seemingly achieved toxic levels of cheesiness. This is, admittedly, the kind of movie where women are regularly terrorized for the sake of getting a rise out of audiences of either gender, like whenever the kidnapped nurses gasp and shriek audibly while bullets and rockets fly over their heads. This is also a movie where Khan, without any ironic winking, uses his shirt as a gas mask so he can give audiences two eyes-full of his well-oiled, Texas-Steak-sized abs and pecs. That kind of self-loving maneuver might as well have been swiped directly from the Old Man Tom Cruise playbook. But somehow, "Tiger Zinda Hai" transcends its inane nature through the sheer force of its creators' convictions. This is, after all, the kind of movie where Kaif gets four or five action scenes—instead of just a token one or two—to flex her muscles. And those sequences are some of the best in the film! Just look at the bit where Kaif launches Tiger, his team, and Zoya up a ramp, and over a group of terrorists. Or how about the scene where Kaif gets to dispatch a room full of baddies after putting on a gymnastics, gun-and-sword-fighting, and wire-fu routine that's just as rousing—and arguably more technically polished--than any big set piece in "Wonder Woman." This is also the kind of movie where even supporting characters like selfish Indian mercenary Firdaus (Paresh Rawal!) and Zoya's fellow Pakistani agents are given time and room enough to show off their skills. See the the disarming moment—if totally contrived—moment that Indian and Pakistani agents share talking about their favorite cricket players. So yes, "Tiger Zinda Hai" is an action movie with more red meat than grey matter between its ears. It won't challenge your core beliefs, or tell you anything daring or new (unless you think putting aside your differences for humanity's sake is a radical concept). But it is exceptionally good comfort food cinema because its creators take their time here to deliver the kind of preposterous canned action poses and improbably heroic feats that action filmmakers have been repackaging and reheating since the '80s, if not earlier. No, the biggest difference between "Tiger Zinda Hai" and other recent proud-to-be-from-Country-X films like "Wolf Warrior II" (the highest grossing Chinese film of this year, and of all time) and "The Admiral: Roaring Currents" (the highest grossing Korean film of 2014, and of all time) is that "Tiger Zinda Hai" is superior cheese. How could you say no to a film that concludes with its two leads dancing joyfully around Greek ruins while back-up dancers break-dance, twerk, and pop-and-lock behind them? "Tiger Zinda Hai" is genuinely charming, and that makes all the difference.